Tygon® Low Permeation Fuel Tubing is designed to meet new emission standards. It is EPA and CARB certified to meet permeation emission standards of 15g/M2/day. 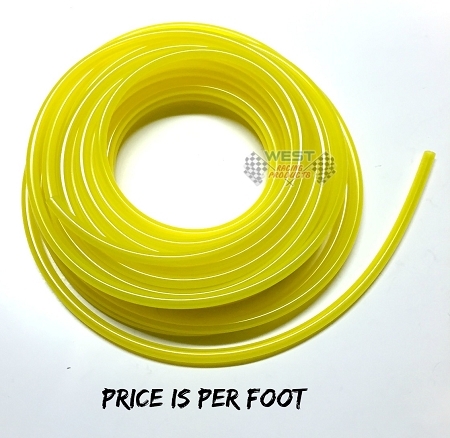 The Fluoropolymer liner is compatible with higher ethanol blend gasoline up to 100%. This robust multi-layer design and construction is resistant to swelling, hardening and cracking caused by hydrocarbon-based fluids and is abrasion, cut and tear resistance for longer service life. It is highly flexible, easy to install and offers excellent fitting retention. It is Ozone and UV light resistant and has a wide temperature range from -20°F to 165°F (-28.9°C to 73.9°C). Common applications include small engine fuel lines, lawn and garden power equipment and lubricating oil and grease transfer lines. Fuel Line Reducer 1/4" to 3/16"